Vit. D3 + K2 (MK-7) 60 caps. The recommended daily allowance is 1 capsule after the main meal. Drink preparation approx. 300 ml of water. The everyday use of the preparation is recommended in order to prevent osteoporosis, particularly in the case of seniors as well as menopausal women. 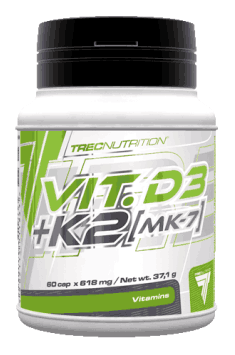 Vitamin K and vitamin D work in synergy and significantly help to improve bone structure. Vitamin D also proves excellent as a way to increase the growth of muscle tissue, particularly when used along with leucine. It has been proven that vitamin D and leucine used at the same time help to increase insulin levels and its receptors, thanks to which they are believed to have anabolic properties, particularly desired by those who care about the growth of muscle tissue. Dietary supplement which improves the body's overall health and well-being. It includes bark of Pau D'Arco. Dietary supplement containing chromium. It regulates appetite and insulin secretion, reduce cholesterol. Menaquinone is the term used for vitamin K2. It appears in short- and long-chain forms, the most popular of which are MK-4 and MK-7, containing respectively 4 and 7 isoprene residues in the side chains. Vitamin K2 exhibits the widest spectrum of its activity by means of osteocalcin, which it has the ability to activate. By means of this hormone produced by bone cells, it may support the state of mineral density of bones and the condition of blood vessels and lower the risk of circulatory diseases. An interesting property of this vitamin is stimulation of Leydig cells to synthesize testosterone, which will be of interest especially to men. K2 also has neuroprotective properties, protecting from excitotoxicity caused by glutamate and oxidative stress from glutathione deficiency. Osteocalcin may also increase adiponectin release from fatty cells, thanks to which it is possible to achieve better insulin sensitivity and decrease inflammations. Menaquinone is contained in dietary supplements available in the offer of muscle-zone.pl.